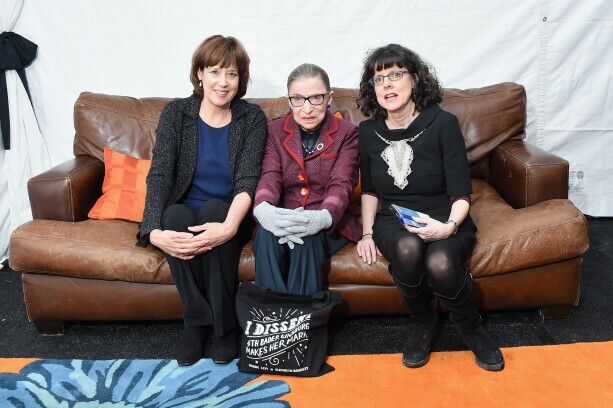 Betsy West, Justice Ruth Bader Ginsburg, and Julie Cohen attend the 'RBG' Premiere during the 2018 Sundance Film Festival in January. It can be difficult to land an interview with a Supreme Court justice. But Betsy West and Julie Cohen, who created a newly released documentary, “RBG,” chronicling the life and career of Ruth Bader Ginsburg, didn’t just land one. Ginsburg let them shoot her lifting weights, which led to a segment on Stephen Colbert, allowed them to shadow her for a day with her granddaughter, and filmed her performing in an opera. “Her initial response was not yet,” said West, who teamed with Cohen after they’d exchanged notes about previously interviewing Ginsburg. West interviewed Ginsburg in 2011 and Cohen in 2015. Both observed the phenomenon of her popularity as the “Notorious RBG.” There were t-shirts, mugs, tattoos and bobbleheads. “We were Ginsburg fans,” said Cohen. But how did they convince her to grant them the access that took Twitter by storm when the film’s trailer was released in March? She’s also among the more open justices. For instance, she went on what some might call a road show in February, making nine appearances in three weeks. This contrasts with Clarence Thomas, who prefers anonymity. Cohen and West asked Ginsburg for an interview in 2015 shortly after the pair set out to produce their documentary. Initially, Ginsburg said not yet, according to West. But then they got to work, interviewing close colleagues, past clients and family members. Eventually, Ginsburg let them in. She allowed Cohen and West to go to the theater with her and visit with her granddaughter. Ginsburg let them ask her questions in a sit down interview, resulting in what became footage that has led to largely positive reviews from film critics. “RBG,” which opened in theaters Friday, offers a rare window into Ginsburg’s life, and also chronicles the arc of her career, from a student at Cornell, to the top court. It details the various cases she took as a lawyer, focusing on gender discrimination and equal rights. The film also covers how as a young attorney, she argued before an all-white and male Supreme Court and prevailed in some cases. The filmmakers pull regularly from archived footage, particularly the 1993 confirmation hearing where Ginsburg explains a fair amount of her early life. Her personal story includes her relationship with her husband, Marty Ginsburg, whom she cared for when he had cancer in their early years as a couple, and raised their child together while dealing with the heavy workload of her legal studies. Ginsburg said that Marty, a beloved figure himself at the court and subject of a Supreme Court cookbook put together by the justices’ spouses, was the first person who liked Ginsburg for her brain. The film offers an education to the public about Ginsburg’s life work and why it’s important. Lawyers who watch it will see some familiar faces. One notable appearance is Ted Olson, of Gibson Dunn, who appears as an interviewee speaking about a Supreme Court case he argued before Ginsburg. In it, he said he failed to convince the court that an all-male Virginia Military Institute should be allowed to remain so and not admit women. In another scene, Martha Minow of Harvard Law School is mentioned in a conversation between Ginsburg and her granddaughter.